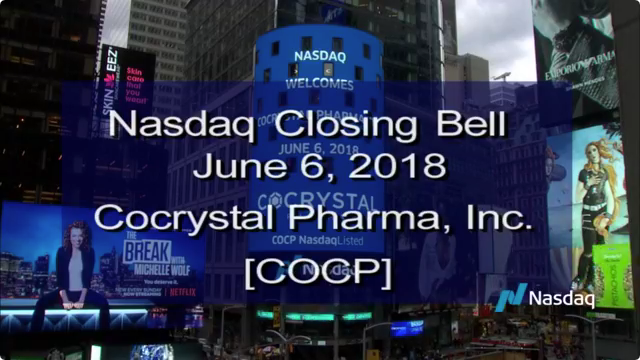 ATLANTA, GA and BOTHELL, WA, June 25, 2018 (GLOBE NEWSWIRE) -- Cocrystal Pharma, Inc. (NASDAQ: COCP), (“Cocrystal” or the “Company”), a clinical stage biotechnology company discovering and developing novel antiviral therapeutics that target the replication machinery of hepatitis viruses, influenza viruses and noroviruses, announced today that it was added to the Russell Microcap® Index at the conclusion of the Russell indexes annual reconstitution on June 22, 2018. Membership in the Russell Microcap® Index, which remains in place for one year, means automatic inclusion in the appropriate growth and value style indexes. FTSE Russell, a leading global index provider, determines membership for its Russell indexes primarily by objective, market-capitalization rankings and style attributes. Russell indexes are widely used by investment managers and institutional investors for index funds and as benchmarks for active investment strategies. The Russell Microcap® Index is one of the most widely used small cap indexes by institutional investors. Approximately 1,500 securities are included in the Russell Microcap® Index, with market capitalizations ranging from $30 million to $1.1 billion. For more information on the Russell Microcap® Index and the index reconstitution, go to the Russell Reconstitution section on the FTSE Russell website.